existing decorations. This is an 1830’s era Georgian style home that has been a private home, a doctor’s office and now a B&B. Interesting tidbit: a woman came to the tour today who is 91 years old and was born in the house when it was the doctor’s office! She remembered coming with her mother as a little girl. 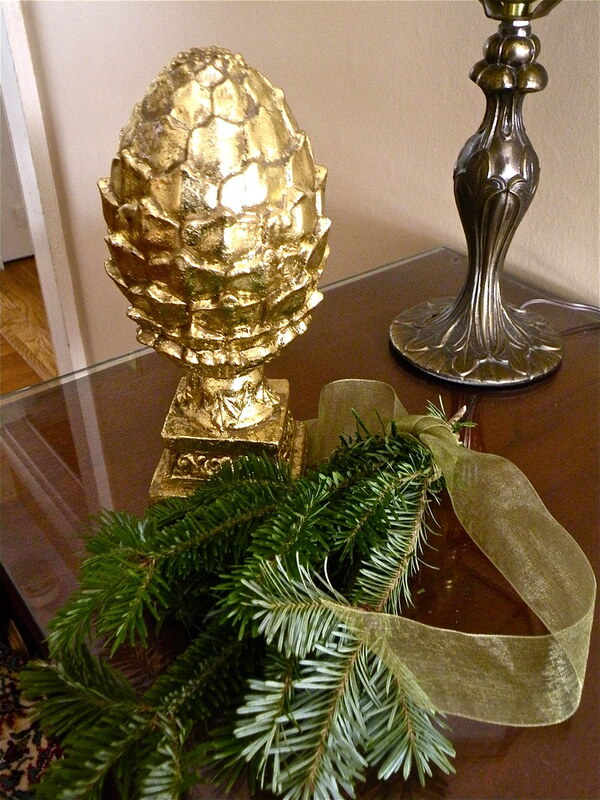 When I first visited the house, I noticed this beautiful hall tree and immediately knew how I wanted to style it. 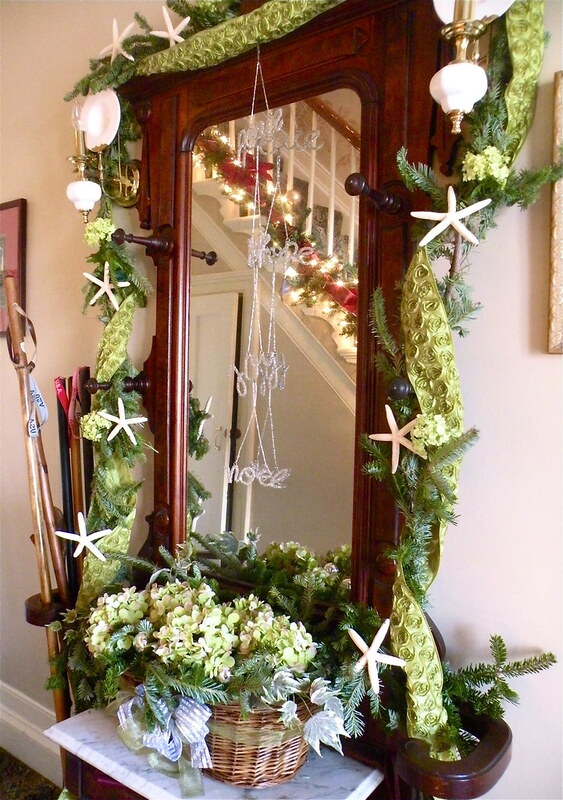 You can’t be on Cape Cod and not do a little nod to the ocean and hydrangeas we are so known for! I’d like to thank Green Valley Christmas Trees for providing the fraser fir garland. It smelled so good! I was so in love with the green ribbon with the silk roses on it that even tho it cost a fortune, I just had to buy it! 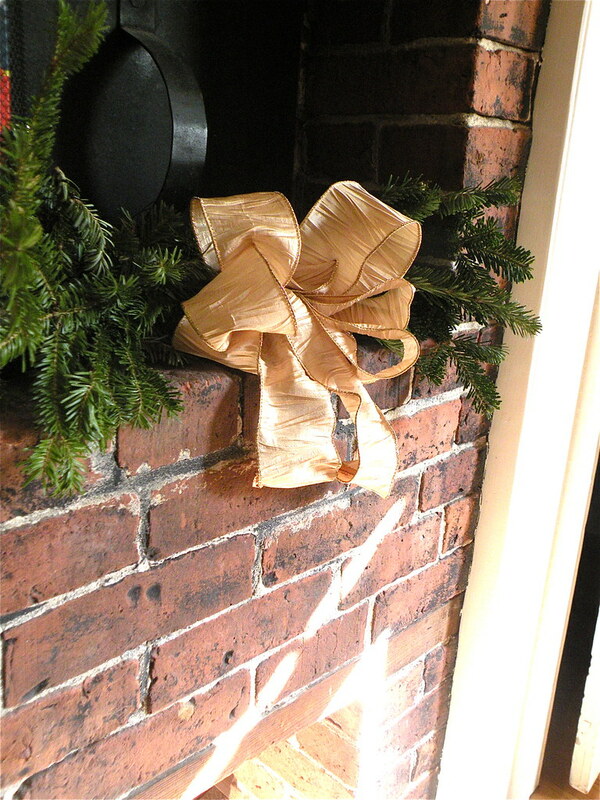 Of course, I love that these types of ribbons can be used over and over again! 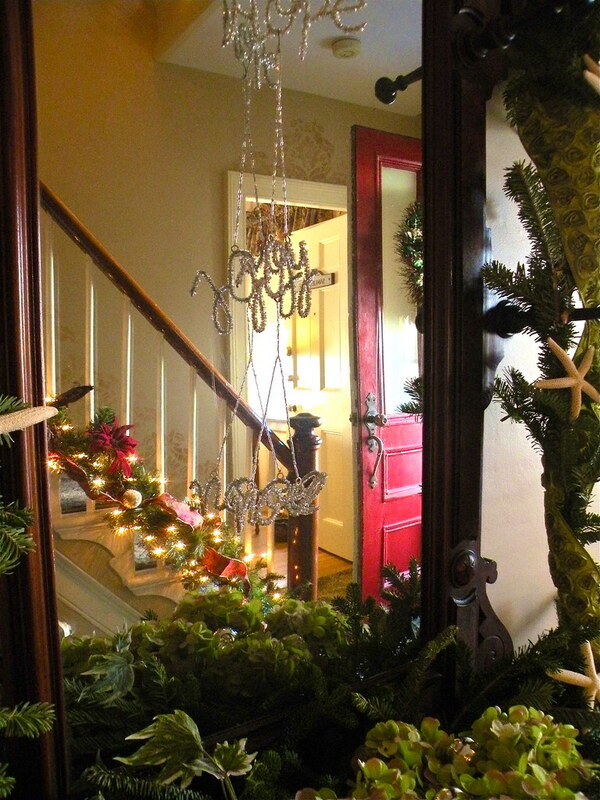 I found the glittery word decorations: Peace – Hope – Joy – Noel in a local store and strung them together and hung on top of the mirror. 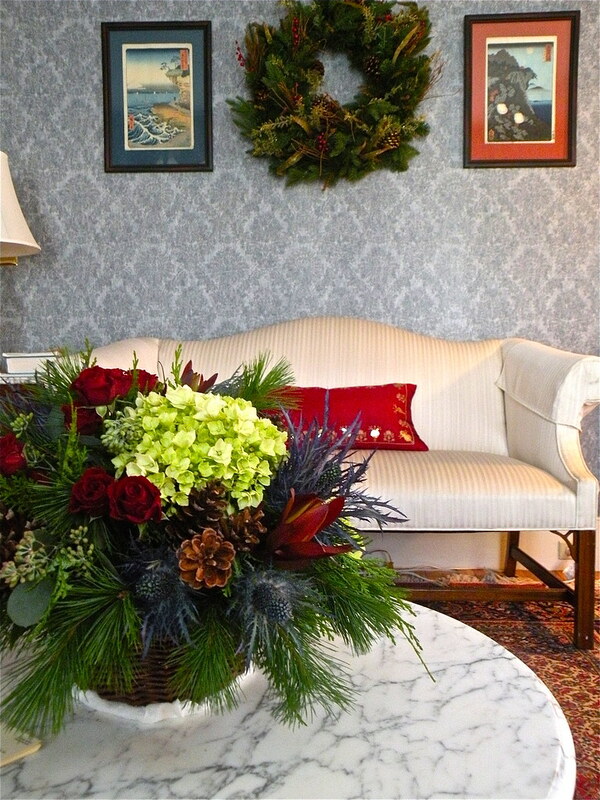 The main parlor is blue and red, so was thrilled with the floral arrangement provided by East Sandwich Flowers. They do the most beautiful arrangements and were kind to provide this gorgeous arrangement for my space. Filled with thistle (my new favorite flower! 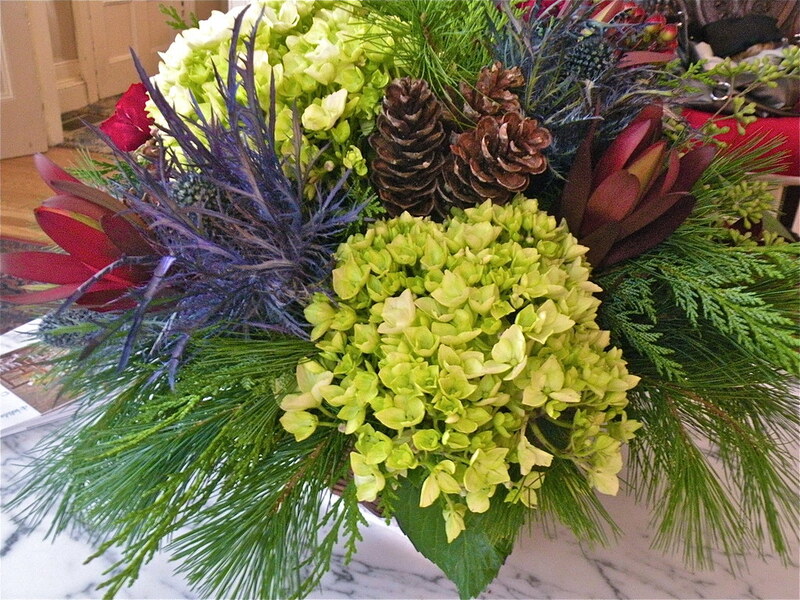 ), deep red roses and hydrangea – great minds were thinking alike! 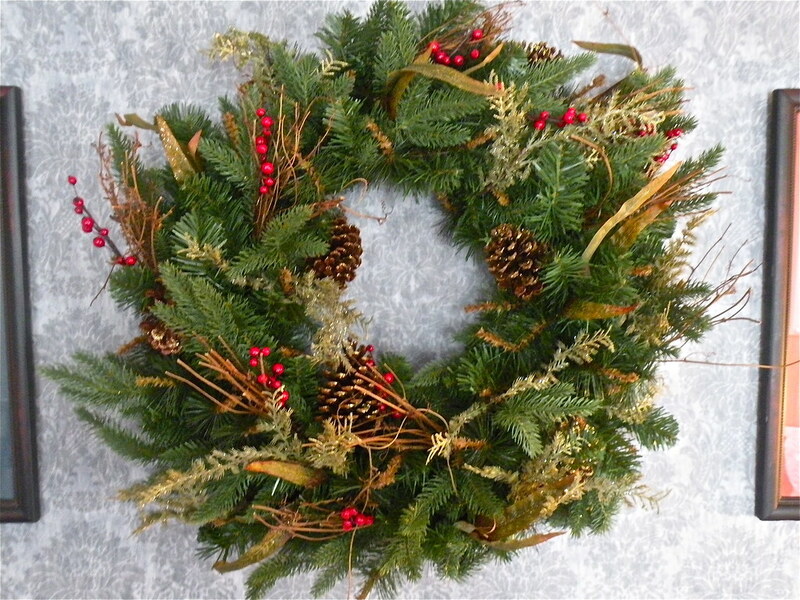 I’d also like to thank Balsam Hill for providing the beautiful artificial wreath that I hung over the sofa. It’s so life like, isn’t it? 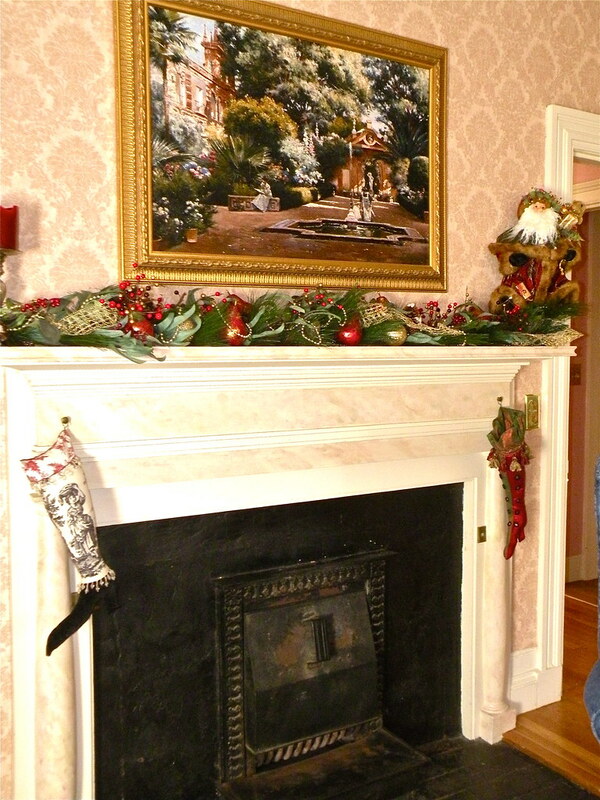 There are times when faux foliage is necessary – such as when hanging on expensive wallpaper. Evergreen sap is not fun to remove if it should bleed! 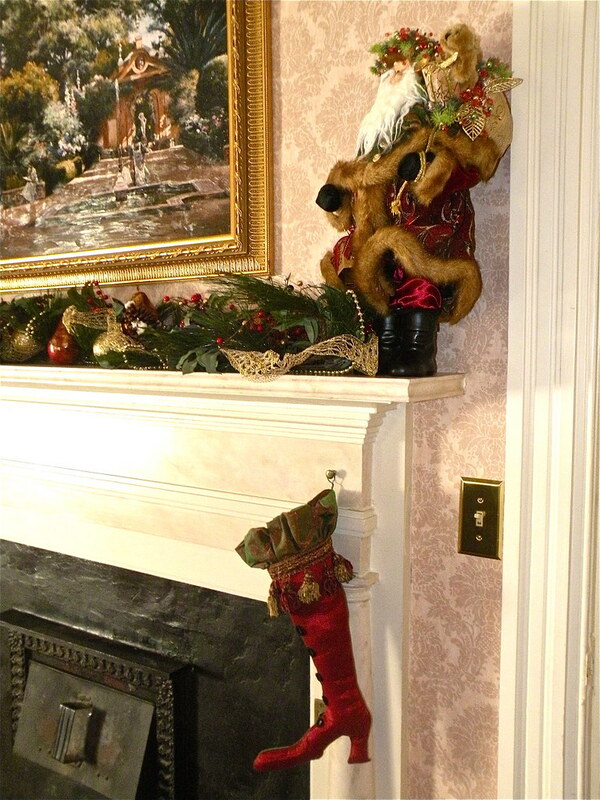 This is the mantle in one of the suite bedrooms. 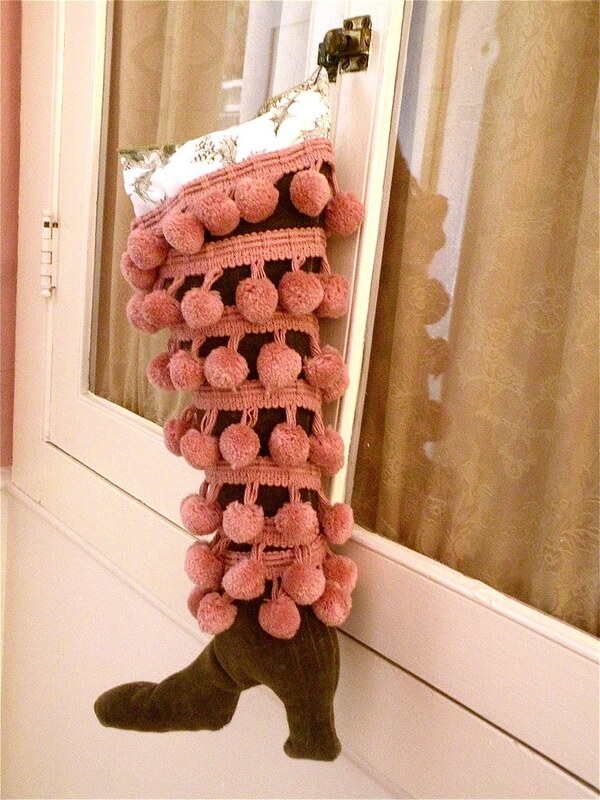 I made the wacky boots several years ago for another showhouse, so it was fun to be able to re-use them here. And here’s another fanciful boot that I made. 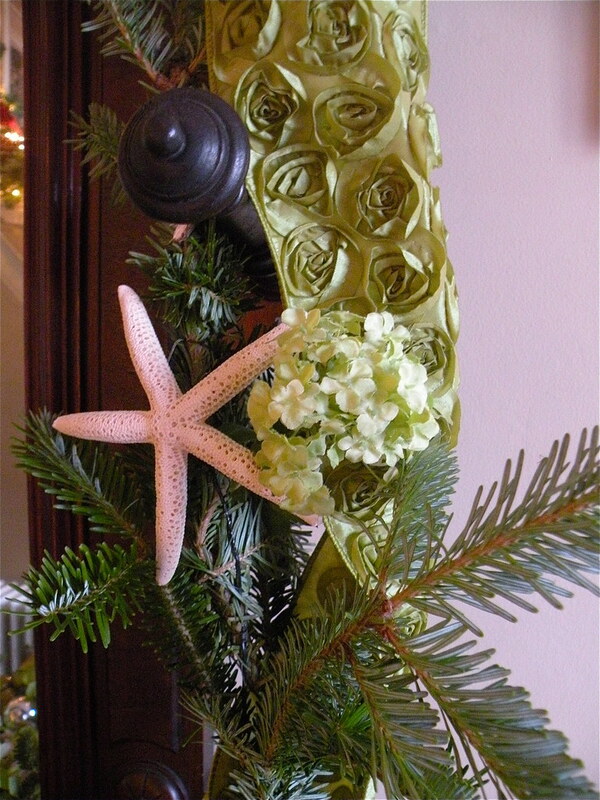 I like adding a few swags of live evergreens around to add some nice pine scent to the air. 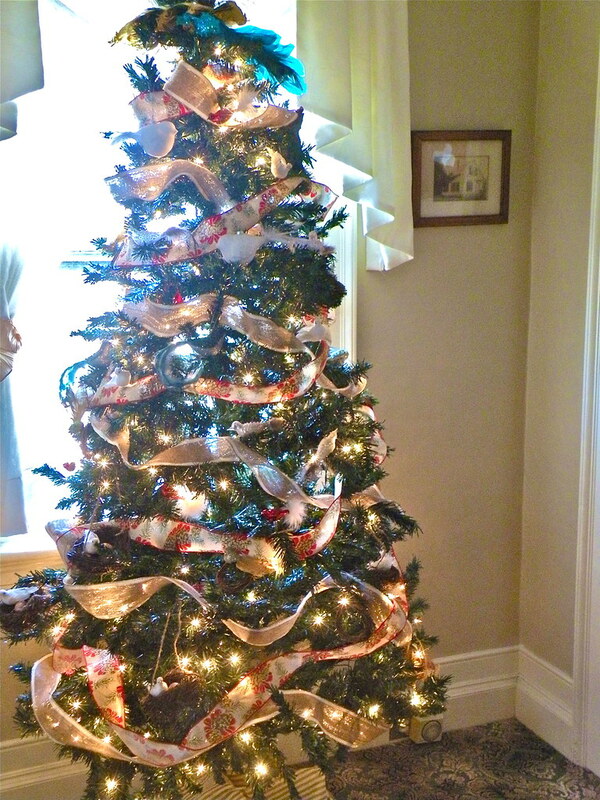 Often, we use artificial trees in these houses – but the real stuff is much needed as well. 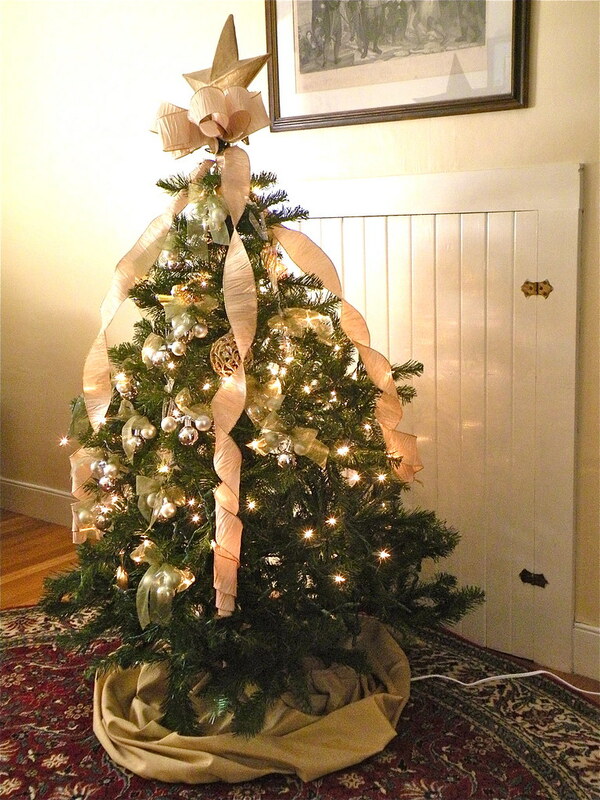 Here is a little 4′ tree I set up in a small sitting area. 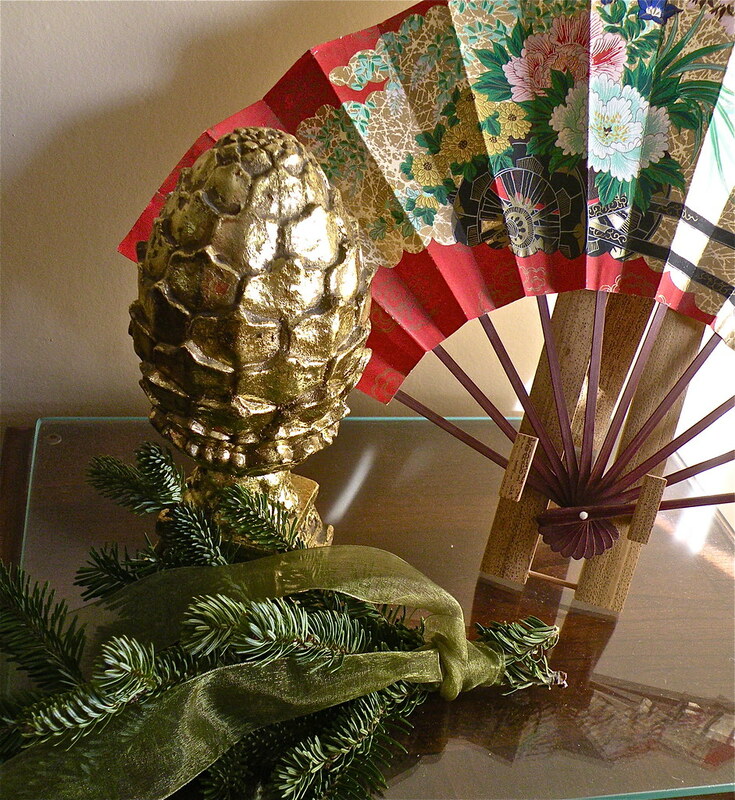 The tree skirt is just a swath of gold silk I have in inventory. I hand wrapped all the silver ball ornament groupings with green organdy. 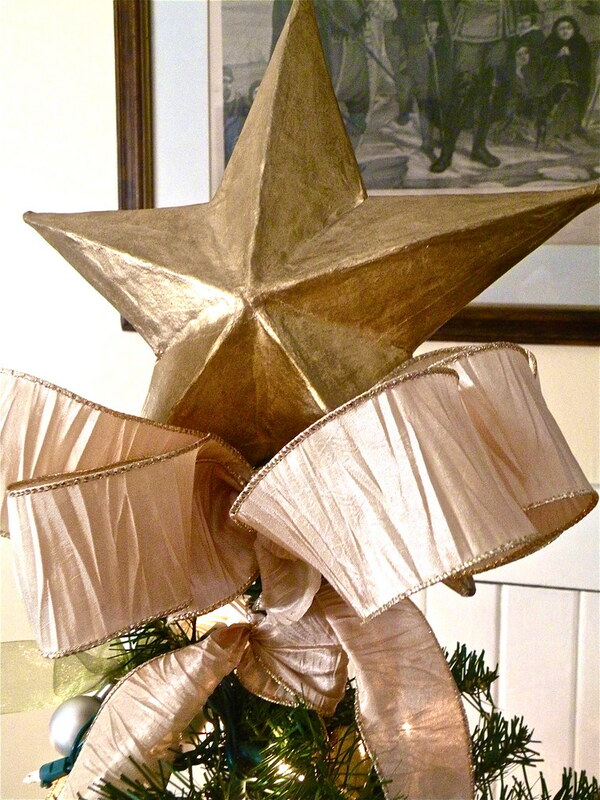 I’d like to thank my friend Rob for the loan of the star – which I manage to borrow every year for one thing or another. 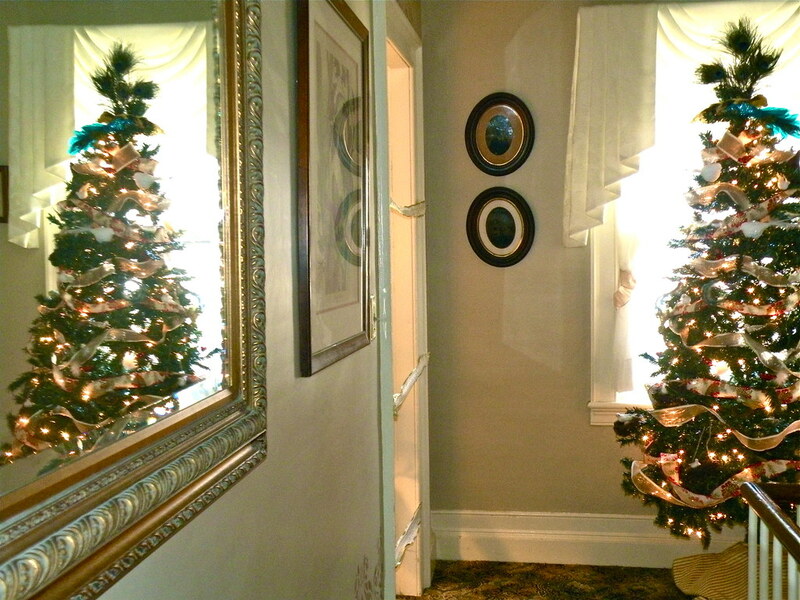 And here is the tree in the upstairs front window. The artwork in the area is all about birds, so I took that cue and every ornament on the tree is a bird. Some are in nests, some look like they are about to take off. 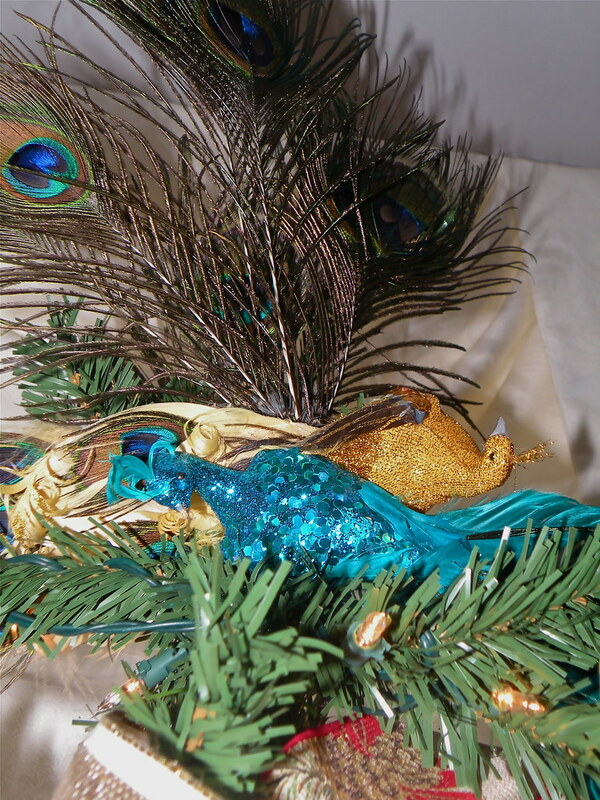 And here is a closeup of the tree topper – the glittery love birds lording it over their less ornamental compatriots! The housetour had a record attendance – they even ran out of the tour books. I’d like to thank several of my blog readers who made the trip to the show. It was so nice to meet you all!